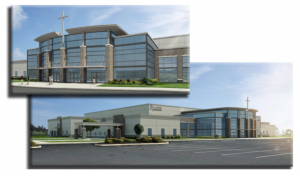 In a recent, free i3 webinar, we detailed all the steps in the church building process. We’ve been highlighting key elements of that webinar here and with this post, continuing delving into the church design phase of the process with a look at utilities and schematics. There are some important church building considerations with regard to utilities. One question to ask is whether there is single-phase or three-phase electricity coming onto your property. This matters from budgetary and future expansion perspectives. Three-phase is more efficient, it can travel through smaller wires, and most commercial motors and commercial equipment require three-phase power. There are also different utility rates for each type of electricity. Your water source can also have consequences for your church design. City water is generally preferable, depending on the water needs of your church building. You cannot feed a building’s sprinkler system directly off a well without installing some type of storage system with an emergency generator and backup pump—which would be a significant added expense. Waste water is another consideration. Tapping into a city’s sewage system is easiest, but if you’re out in the country or in a newly developing area of your community, you may have to work through your county health department to get approval for a septic system. Another important step in the design phase is creating visual representations of what you plan to build. 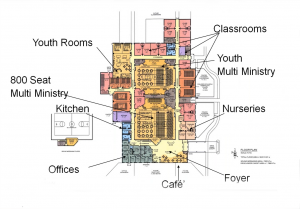 Schematic plans for church designs like the one here, show the relationships of various spaces in the church building. Your church design is created to solve your ministry needs, but it must also meet zoning and building codes in order to be approved. This is why each church building must have a certain number of exits, doors that swing the right way for safe egress, hallways that don’t dead-end, and so forth. A schematic floor plan shows where everything is located. This includes church building spaces, such as the foyer, the cafe, the offices, and the worship center. It also shows how your church building is going to function. Is the children’s area secure? Are related components of your various ministries located close to one another? Is there enough room for everything to be installed in your kitchen, and does the design accommodate workflow needs? While the schematic plan for church design is very detailed, it’s not the only useful rendering created during the design phase. Two other types are helpful. 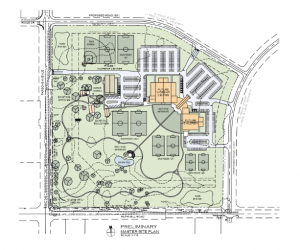 The first is a site master plan for your entire property. As you can see here, the master plan includes any future phases of your church complex and how you intend to develop the site over the next ten to twenty years. The second type is the 3D rendering, which is a very useful tool for your capital campaign. A 3D image like this gives everyone the sense of what your new church building will look and feel like when the project is completed. The next step in the process is to undertake a budget review to make certain that you can afford to build what you have designed. We’ll discuss that in our next installment. Meanwhile, we are wrapping up the details of our 2019 free i3 webinar series. If there’s something you would like to learn more about, please contact us at 800-625-6448.